This sweet girl's dress is sleeveless and has a sheer embroidered organza overlay. Underlayer has a colored taffeta edge and a tulle ruffle for fullness underneath. Embroidery work embellished with a metallic thread adorns the skirt in an intricate floral design near the lower edge of the dress and is finished by rich colored taffeta underlaying hemline. The waistline is sached with the same rich color as the hemline and has an affixed bow on the front hip, while the sash around the back ties into a big beautiful bow. Pearlized buttons complete the back zipper closure. 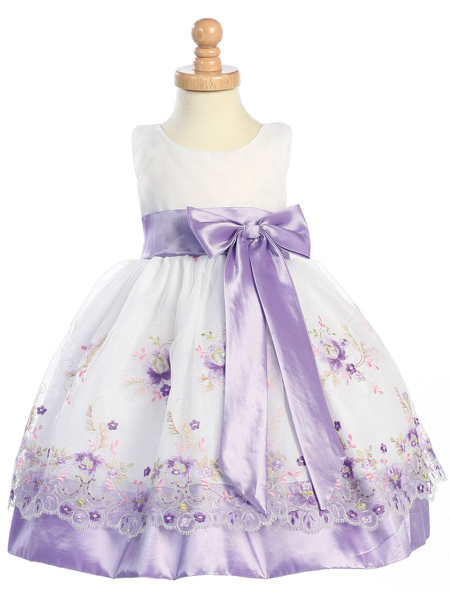 Perfect for Christening, Easter, Flower girls, Weddings or other special events and occasions.